When you represent Fine German Precision you're Bruce, when you flog your car like it slept with your mama you're a hoon. But what if you make something so bad you can't look away? You're Yanni. We around here have mostly referred to the kind of JC Whitneyed, fake hood-vented cars as "lame" or "fake" or "posermobiles." They're all those things, but some people take it so far you shake your head in appreciation of how awful they've become. It's easy to be bad, but when you see the Dragon 'Vette you realize it's a lot of work to be that bad. 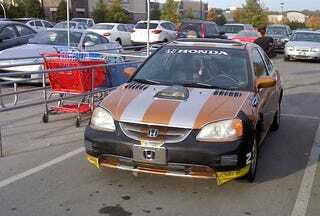 Reader Spencedaddy found just that when he stumbled upon this hideously modified Civic. Yellow brakes? Check. Fake hood vents on the rear fender? Check. Fake chrome locking mechanism? Check. Yanni album?!? Yes, there's a Yanni album there. There's no better patron saint for all things fantastically miserable than Yanni. Thanks to Spencedaddy and his friend for shooting this video and finally giving us a way to describe the epically bad "custom" cars tarnishing our streets.